Cupboards Kitchen and Bath: #WordlessWednesday - Art or Redneck Furniture? Raina- HA! I love it... that's what I will call it. Looks like something from The Dark Crystal, which you are too young to remember. Ok...first, I love the pieces of wood. They are stupendous. BUT....what the heck is up with the legs? I'm thinking a chair like that would have looked so awesome with some chunky to tapered legs, maybe craftsman style. 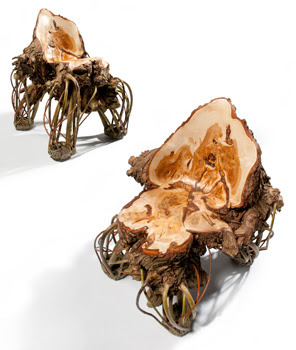 These chairs as made, though, would make for great tree stand chairs, as they would certainly camoflauge well out in the woods. Those look dusty, uncomfortable and as Raina put it, like a mother nature hairball. James- Why didn't I think of that? Robin- Yes, you're right... I have no idea what/who that is. Amy- Wood is good, chairs are bad. Just say no. Ha! I'll take them if you throw in a pair of forest chaps leg guards.